(Author’s note) My memories of the evening are a bit fuzzy, and the notes from my original blog post are vague, so I am doing my best to reconstruct the events. After witnessing the 20 Frosty challenge in the morning, we all had a relaxing afternoon at Hello House before heading out in the evening for Thursday evening karaoke. Green was still not feeling well, so he was a lot more restrained than usual. I believe the rest of the group decided to do some pre-drinking at Hello House. We rode Nanbu line to Kawasaki and then took Tokaido line to Yokohama in order to meet up with my usual Thursday evening karaoke group. When everyone assembled, we all walked to Big Echo. Unlike the previous week, Code Red had left his video camera back at Hello House. 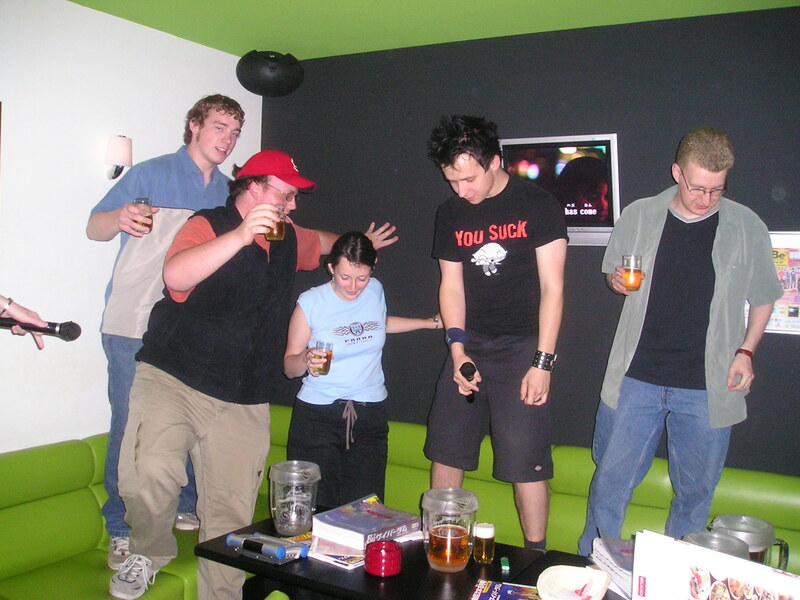 We had two fun hours of karaoke, making good use of the “all you can drink” policy of our karaoke room. Green was not drinking much, so Flounder, Hippie, Code Red, and I all decided to pick up the slack. During the evening, one of Jem’s roommates, let’s call her Rana, was flirting with Code Red hard. Code Red was wearing a t-shirt featuring Stewie from Family Guy. On the walk back to Yokohama station, Jem’s roommate told Code Red that she really liked his shirt, and wanted to trade. Code Red did not want to trade his Stewie shirt for Rana’s shirt. She kept asking, and he kept refusing. At this point, Green, Flounder, Hippie and I decided to act like helpful gentlemen and get Rana the shirt she wanted. We grabbed Code Red and pulled off his Stewie shirt while we were walking through the shopping area of Yokohama station. We handed the shirt to Rana, and then she proceeded to remove her shirt to give to Code Red. While Code Red was shirtless, we all started slapping his exposed back, leaving huge red hand prints. Yes, this is the kind of thing that drunk frat boys do when they like each other. Unsurprisingly, the spectacle of a shirtless gaijin guy being attacked by his friends while a gaijin female removed her shirt in a major train station attracted some attention. We received a lot of stares and laughs from people passing by, and also got noticed by the train station security staff, who watched us carefully as we bought tickets and waited on the platform. Although he probably could have turned the “give my shirt back” game into a night outside of Hello House, Code Red instead insisted that he get his Stewie t-shirt back before our train came. Rana reluctantly agreed and they again swapped shirts. At some point during our excitement, we actually lost Hippie for a few minutes. I can’t exactly remember the details, but he did turn up before the train left. Through most of our adventures so far, Green had been the drunk crazy guy. With Green taking it easy, we all stepped up our game. As it turned out, our group was better when we only had one designated drunk crazy guy rather than four. This entry was posted on June 15, 2014, 8:00 pm and is filed under Drinking, Karaoke, Shenanigans, Team Awesome Sauce. You can follow any responses to this entry through RSS 2.0. You can leave a response, or trackback from your own site.